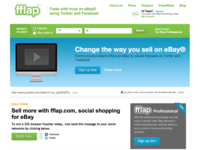 fflap launches 2nd Gen Social Shopping tool for eBay traders by Freesourcing. fflap, the social shopping management platform, has launched a complete rebuild of the online tool that has revolutionized the eBay experience. fflap is the brainchild of Jonathan Yates – entrepreneur and author of "Freesourcing: How to Start a Business with No Money". fflap, the social shopping management platform, has launched a complete rebuild of the online tool that has revolutionized the eBay experience. fflap is the brainchild of Jonathan Yates – entrepreneur and author of Freesourcing: How to Start a Business with No Money. Jonathan wanted to prove the worth of his most recent book after critics suggested it couldn't and hadn't be done before. fflap.com was started using free software, free computers, free information and freely available code with alot of hard work and effort. The site has been trading since April 2010. Yates has worked with a talented team of developers from PixelVector and a marketing team from Invoke Media. With their help, he launched a full rebuild of the site on Monday, February 14th, 2011. The social shopping-based innovation helps eBay businesses connect with their social networks and has already proved successful. Businesses can offer recent, relevant information interspersed with new offers — encouraging loyal followers and repeat customers. 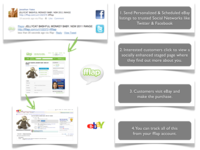 fflap is a social shopping management solution for eBay sellers around the world. Incorporated in 2010, it is a dynamic tool allowing sellers to harness the power of their social networks. fflap is powered by socialjet a developer social shopping platform from VUME. For more information about us, please visit www.fflap.com.